JungleWatch: I LOVE MY CHURCH! TODAY. AND IT'S JUST THE BEGINNING. I LOVE MY CHURCH! TODAY. AND IT'S JUST THE BEGINNING. Kudos and God's abundant blessings to the Members of the CHURCH MILITANT who attended this morning's protest at the Chancery. The photo of the group walking up the hill and standing in front of the building reminded me of The Catholic Action Song (AKA "An Army of Youth") from my early days. Instead of "An army of youth … fighting for Christ Our Lord … for our flag, for our Faith, for Christ the King …" we see a small but determined Army of Faithful Catholics fighting to heal our broken Church in order to preserve the AUTHENTIC One, Holy, Catholic and Apostolic Church for future generations, for Christ the King and for the eternal Glory of God. I look forward to seeing you on Sunday 3 May! Sen Dangkolo Na Si Yu'os Ma'ase todus Hamyo! May the Lord Bless you always! Thank you all who attended on our behalf. Your courage and efforts are appreciated by those of us who are unable to attend. God bless you. Biba Katoliku!!! familiar faces. thank you for your witness. Yes, all familiar. And brave. These are some of the most beautiful pictures I have seen of Guam. I will try to be at the next gathering. I'm so proud of my fellow CCOG members seeing them demonstrating in front of the Chancery. I regret I wasn't able to render my support due to my nephew's funeral at St. Teresita, Mangilao. Just a thought to ponder. Since the Archbishop abandoned his true Catholic family, isn't he essentially excommunicating himself from the true church? Last Sunday's Gospel on the Good Shepherd sort of worked in reverse for the Archbishop. He left his flock of thousands to mingle with the wolves. Watched Archbishop on Good Shepherd Sunday. Read a canned homily and never looked at his flock. Booooo! Looking at these photos, it seems that the Toto parishioners came out strong...yes, sting in faith and spirit. See you all for the motorcade . Sorry couldn't make it his morning..work calls at 8am. Wow, what a dedicated group of true Catholics! I wish I have the same dauntless courage at this point in my life. You inspire me and many young people on Guam! Speaking of today...is it just me, or is it just me? I had to take a double look at today's PDN front page. I almost said, what is Fr Edivaldo up to again, that the court had to reverse decision. Look at the photo. He looks like a split image of that man! These are our man'amko fighting for us. They have the life experience, respect, culture, and commitment to our local Catholics. They survived the hardship during the war. So KIKO and his NEOCATS, try and convince our elders to change their believes. You can choose those who are seeking answers but you won't be able to get our man'amko to change. You are not worth their dignity. AAA, you have disrespected our man'amko and our people for this foreigner (KIKO). I hope your parents are not turning in their grave. So, Archbishop, where are you, peeking out the window of your house? Secretly spitting at our Man'amko? Why don't you come out with your room mate Pius? Come out and apologize. Simple as that. Then hire lawyers to correct your treachery. Or did you know about the prayer/demonstration and go to stay at the Westin or the Marriot? Tim, where are the throngs you predicted? HMMMMMMM? Give it up. They'll be gone soon, I'm not worried. LOL. Show me where I predicted throngs. But given that this is the first time in the 400 year history of the Catholic Church that Catholics have protested against their bishop outside his residence and office, I'd say that's a pretty good showing. And P.S., read the title to the post: Just the beginning. Thanks for allowing me to waste more of your already wasted life on my blog. Come again. Pretty closed bank. Fr. R. Ps pope said no boring homilies. Did you hear? Don't male homily against the blog, ok? That's right. You didn't see me there. You see, the archbishop wants everyone to believe that Tim Rohr is the cause of all this division and that people wouldn't be protesting if I didn't put them up to it. He is desperate for this illusion to be true. But it's not. These are people who have decided to take action quite without me. Thanks for allowing me the opportunity to waste your life on my blog. God bless you all! In this division there are only two sides: the side of The Authentic Catholic Church or for the side of kiko''s Church. These courageous souls certainly are on the right side of this battle!. Katoliku til God's Kingdom come! Wasn't able to be present there this morning, but definitely will for another round! Thank you all for your courage and participation. Unfortunately I couldn't make it, you all are in my prayers. Please continue to represent us True Catholics of Guam. I wish some day, we will come together as one - UNITED. May God bless all of you! We can all learn from the courage of these individuals. Don't worry.. All of these old farts will be dead soon. I'm not in the Neo, I'm just tired of all this hypocrisy. 4:09, don't you dare make fun of the man'amko. They are the ones that put up the Churches with their own sweat and sacrifices. You have no idea what many of them went through after the war to rebuild the churches and their lives. You ungrateful wretch! They would not be picketing if the supposed archbishop is doing his job of building rather than tearing it down. It must have taken a lot to show their faces and emotions at that gathering. I hope you haven't cursed yourself by your unnecessary insult and attitude. If there is any hypocrite here, it is you. What have you done for your church lately? You must revel in riding on the coat tails of others who have greater stake in restoring the health of the Archdiocese. 4:09, don't be surprised if those elder faithful Catholics outlive you. Now that's something for you to think about. I suspect you're not from here and a moocher who doesn't have a real job. I doubt that you're Catholic. LOL. But he hangs out on this blog. Oh, the courage of "anonymous". 8:52 AM you're just a TROLL who has nothing better to do. You will die just like any worthless creature and may end up in a landfill where the animal shelter disposes the carcasses of the animals they killed. Goodbye. Anon 4:09, speaking from experience right? Your parents already passed away right? I'm pretty sure if they were alive, they will also be joining our strong man'amko group. And you're the biggest joke so far...you are a NEO. If you're trying to hide your identity, please come up with a better lie than to tell everyone "you're not a NEO". It's probably Zoltan in another one of his reincarnations. Secretary of State Vatican City received these photos. Thankyou. Congratulations to the men and women who supported the street protest this morning. This is exactly what our Holy Father asks us to do. Go out into the streets and maka a noise that the dictator must be removed. Oh, Fr. R. You so funny. But keep it up and sooner or later I'll be using your full name...and your girlfriend's. Ooolala! First we have cashee, cashee..now we have Jonestown. Must be the ladies in red! I do not recall a Jonestown on Guam . But there is one in America. Thank you Tim 6.57pm . At least we know children are safe . Fr.R?........hmmmmm.......I think I have an idea who he is.....we have a few Fr. R's on Guam. I'm having too much fun letting people guess who you are...and making you come back here over and over again to see what they are saying. @9:55PM, don't you know about Ms. JONESTOWN from TAMUNINGVILLE? Anonymous at 11:16 PM said: "Go ahead and use my name Tim, I thought you weren't scared"
This would be funny if it wasn't so sad. Do these people even read what they type before sending? Going through notes last night I kept over the years identified who fr. R is. Yes Tim you are correct in your evaluation. Surprised Fr. R. Comes this blog for what reason. Concern only money. New bishop may not be so happy Fr.R. Go home live a good life before God calls you. Seriously. Don't be under the spell of Tim, he claims to be from Guam. He's delusional. ANON 11:16....where did Tim "claim" to be from Guam? Anonymous (April 28, 2015 at 11:16 PM), just when and where did you hear Tim ever claim "to be FROM Guam"? He has said during CCOG meetings that, having first come to the island — with his beautiful wife and one child — to teach at a local school, what he thought would be a temporary stay has lasted for more than 20 years! In that span of time, 10 more children were added to his family. As a result, it is natural for Tim to refer to Guam as "home" for the Rohr Family, which is very different from what you wrote. However, if you think you heard Tim say that he is "from Guam," it's quite clear that it is YOU who is the delusional one. I see that I will be in good company for the next scheduled demonstration, dispensa sa ti hufa'tinas esti nabiahe (sorry didn't make this one). So hopefully by the next rally/demonstration, the students and parents of St thomas Aquinas could come out enmass to join in sending AAA our despidida message. Anonymous @4:09 and @8:52--When I read your posts I felt sorry for you. Obviously you did not grow up in a family where your elders play an important part of your growing up years! "Old farts?!" Tai rispetu!! When you become their age and feel so passionately about something, like these people feel about what's happening in their Church, I hope the young ones will have more respect towards you! Tim,is this the Father R that used to be at OLOTW and then moved over to Asan? My dear Mother didn't like him right from the start when he was there. She told us that all he seemed to care about was money, money, money. We stopped going to mass there and went to Agana Heights where my kids grew in their faith, were inspired to join the choir and became altar servers under the guidance of the friendly and pious Capuchin fathers that are so dearly loved there. Is there a reason why he was transferred to Tamuning, where they seem to send all their so-called wayward sons? Why were Father Paul and Monsignor James sent there, of all places? I thought St. Anthony's was a strong Neo parish. Anyone knowing full name of " woman" please can you forward to Archbishop Krebs. Don't need to go there. Too, too short to recognize, anyway...he he he. She really is a lillyputian...but they are very good friends. Anonymous @11:16--He's more 'from Guam' than those neo presbyters NCW is bringing in. Tim embraces the culture more than they do! And 'under the spell of Tim'?? It really appears as if the Guam Neos are caught up under a spell that is brought about with the teachings of Kiko. Tim is not making up or changing things....Kiko is. Tim does not say "just believe...don't ask questions", Kiko expects that of Neos. And this is just a couple of examples!! Watchdogs identified Fr. R. Information regarding this guy confirmed years ago. It is also known by Bishop Apuron. 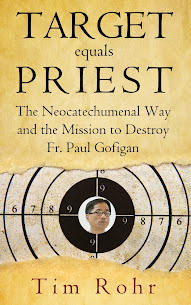 A few year ago Fr.R launched a personal attack on Bishop Apuron. Both revealed dark sides of their character. Mutual agreement made not to expose each other. It is also known all this guy wants is money. should this be exposed another huge scandal for Bishop Apuron. Yet another huge scandal? Fr. R?? Doubt it. No. No scandal. People have known for years and never bothered. The man invites ridicule because he preaches against me from the pulpit. Im old now my mind does not work as fast as it should. However, thank God I can make connections. I will contact the Apostolic delegate concerning this Fr. R. Not because of what we know about him but rather another matter of justice. You see Tim on this page over a year ago there was an incident reported by you which Fr. R. Should have defended by moral principle. He remained silent in the midst of grave injustice . It will be on this point he will be reported. Regarding the girl friend she is accepted now. Through the process of elimination and known facts, we were able to deduce who you are, Fr. R.....! We know who you are, but you don't know who of us know. We don't think its Tim who is scared. Protested against Archbishop by wearing a beard. Now yelling at us for protesting Arch. Troublemaker. Is he neo or not? No. Just a very angry man. Pray for him...before it's too late. Count about 50 people protesting outside chancery. Big number for a catholic island where no one speaks against the church. if this number grows in the motorcade it makes a loud statement. Apuron had had his reward through earthly treasures, and it is puny compared to what he could have had as his legacy: respect and affection of the people of Guam, and the eternal gratitude of the universal church. So sad, he squandered the pearl of great price for colored pebbles. To be very honest the archdiocese is now a free for all with no leadership or order. Everyone now has a right to speak and partake in activism in order to restore the integrity of the church in the entire region. It is a church with no leadership and the best response is now activism . Take to the streets join a non violent protest and protect the catholic church . Join the motorcae make it island wide and let your voice be heard. This is the time to be at the Heart of the Revolution. For the Good of Holy Mother Church in the Metropolitian See of Agana Guam it is hoped that His Excellency Archbishop Anthony Sablan Apuron Ofm cap will freely submit his resignation to the Roman pontiff immediately. For the Good of the Catholic Church in the Diocese of Rev. Matthew Blockley belongs to. He shall submit his resignation to the ordinary of his diocese. If you are a priest, then humble yourself and inform your bishop of what you partake in someone else's diocese. Mind your business fr. LOL. That's just the problem. He doesn't have a bishop and he hasn't had one for five years. Wonder why? Saipan. However, the damage occurred when he was in this diocese. And he has a right to see those wrongs righted. But apparently he needs to stand in line. A long one. I do not belong to the Archdiocese of Agana Guam so Apuron is not my bishop. I can do what ever I choose to do and frankly only the pope has authority over me. As I have said to Archbishop Krebs when the Holy Father or Archbishop Krebs ask me to stop my comments I will. Until that time I encourage Apuron to humbly offer his resignation to the Holy Father. At the same time encouraging loyal Catholics to join the motorcade and show that enough is enough. Many priests would be speaking out against abusive bishops if the structure allows. Its like Jean Valjean's dilemma in Les Miz: "if I speak I am condemned; if I stay silent I am damned." The notion of obedience to episcopal power is eschewed, and open to exploitation by scheming bishops. The military has a mandate not to obey a commander's unlawful order in spite of the unbending hierarchical structure. If only the universal Church has recourse to a similar mandate, many of these issues can be resolved a lot quicker. Since the people in the archdiocese of agana are protesting against their bishop. Then I guess the people who are protesting should do what the people in Baltimore are currently doing. Like burn the bishops can and protest against the Catholic Church. Catholics fighting against catholics. Wow. Guam catholics who are protesting should be ashamed. What do you think other religions say about the Catholic Church? Fighting from within and not having peace. Violence is not the answer but this is where it might lead up to. For example, the slashing of the archbishops tires. Violence. Keep the peace because no matter what we still have to fight against the devil. Do not fall into the Devils trap and plot against the Bishop who is by virtue of his ordination in persona christi and has the fullness of the priesthood. All priests share in the priesthood of their bishop. Without the bishop, the priest cannot function. No one in that group is suggesting violence, so that leaves only YOU. And you are right, we ARE "ashamed". We are ashamed of a bishop who has no compunction about lying, cheating, stealing, and defrauding his own people. We are ashamed of a bishop who mocks the magisterium of the Catholic Church. We are ashamed of a bishop who embraces and celebrates an illicit liturgy. We are ashamed of a bishop who undermines and ridicules the vocation of local boys while he imports personal eye candy. And "Catholics fighting Catholics". That's where you're wrong. Jesus told us that we would find the abomination in the temple, not without. And so we have. Anonymous @ 10:48PM: These Fr. Pius talking points you perpetuate are not only asinine, they are intended to keep you from thinking for yourself. You should be ashamed for allowing him to condition you to ignore your conscience and instructing you to perpetuate the lies and deception being coordinated by him and the NCW leadership on Guam and off island. 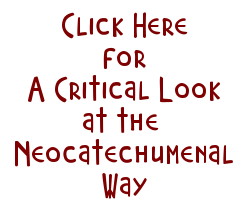 The devil's trap is the Neocatechumenal Way. Apuron fell for it and he should be ASHAMED!! As archbishop he is being led by the nose by Pius, a priest, who should be his subordinate. This bishop has personally and publicly sided with Kiko against the pope. We have a right and duty to oppose him. By following Kiko, AAA clearly is NOT in communion with the pope so he needs to to resign. STEP DOWN TONY!! Against the pope ????????? go home Tim ! Imported personal eye candy. Exactly what is going on here.